Upgrade your membership now - this is YOUR MARKETING DOLLARS WELL SPENT! The goal of the Enhanced Membership Program is to ensure member involvement with the Salem Chamber and the community in general in an optimum fashion while providing a solid foundation for the Chamber to operate at its highest potential. Participants in the enhanced membership program are recognized year-round at major events, on our website, and in Chamber programs and publications. Enhanced Members are asked only one time about contributions, sponsorships and/or advertising opportunities, making it more efficient from a time and budgeting standpoint. The Chamber benefits by knowing every year what sponsorships and non-dues income it can expect to receive. Current Sustaining Sponsors: Cabot Wealth Management, Cinema Salem, Coffee Time Bake Shop, Wylie Inn at Endicott College, Enterprise Center at Salem State, Finz Seafood & Grill / Sea Level Oyster Bar, Goldberg Properties, Groom Construction, Jacqueline’s Gourmet Cookies, Kensington-Stobart Gallery, YMCA of the North Shore, RCG, Rockafellas, Boston Harbor Cruises (Salem Ferry), Salem Car Wash, Soucy Insurance, Tinti, Quinn, Grover & Frey, P.C. Current Intermediate Sponsors: Armstrong Field Real Estate, Drumlin Group / David Hark Associates, Harbor Sweets, North Shore Bank, Northeast Gateway Energy Bridge, LP,Peoples United Bank, Salem Waterfront Hotel & Marina, Sheraton Colonial Boston North Hotel & Conference Center, Sinister Stories of Salem Walking Tour, Spaulding Rehab Network, TD Bank, Wire 4 Hire, Inc.
*All packages include a basic Level Membership Investment ($295 for-profit, $160 non-profit). 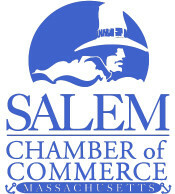 Hope you'll consider increasing your marketing efforts and support for the Salem Chamber at the same time. Please give us a call (T. 978-744-004) or email us if you would like to discuss your options.We are happy to build and tailor a package made just for you and your business.